Carbon Flexback Blades – These bandsaw blades are made from a solid piece of carbon steel with a flexible back. Their teeth are heat treated to retain their sharp edge. Carbon Flexback blades are a low cost alternative on easy to cut material. Carbon Flexback blades have an excellent fatigue factor to give long saw blade life on bandsaws running at high speed, cutting non-ferrous metal, and wood. Its flexible backer is also suitable for absorbing contour cutting stresses. There are a great variety of saw blade widths, thickness’, and tooth shapes to suit any band sawing purpose. The two most popular saw blade tooth patterns are the hook tooth (H), and the raker tooth (R). The hook tooth band saw blades have a 10 degree positive rake angle for fast cutting of non-ferrous metals and wood cutting. 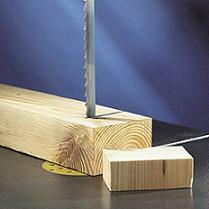 The raker tooth is a conventional saw blade tooth used for general purpose bandsawing. There are many types of band saws that can use flexback saw blades including Jet, Wilton, Kalamazoo, Tannewitz, Doall, Grizzly, Harborfreight, Powermatic, Wears, 14″ bandsaws, Hyd-Mech and many others. Any light to medium duty vertical bandsaw or horizontal bandsaw typically run carbon bandsaw blades. Most hobbyists and craftsmen with a bench top bandsaw or a 2 or 3 wheel bandsaw prefer the many benefits of using these types of bandsaw blades.